Join MCASB and UCSB’s Department of Art and College of Creative Studies for a presentation and conversation with Texas-based painter, print maker, and socially engaged artist Cruz Ortiz. He will be speaking about his recent portrait work, musical influences, and current archival practices as well as his alter ego Spaztek. 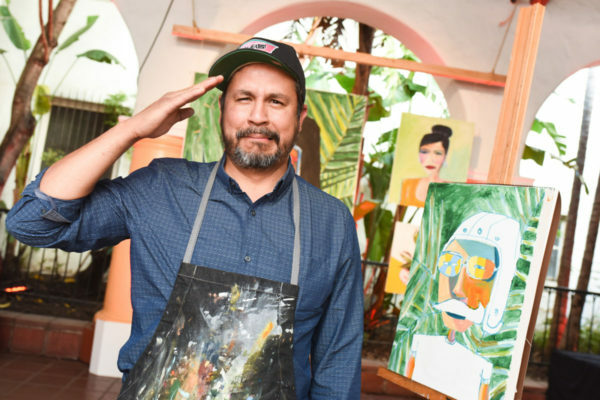 Ortiz recently completed a project in Santa Barbara, El Johnny the Satellite y El Burro Borracho, as part of MCASB’s public art program takepart | makeart: arte para todos. Open to the public, free to participate, and with bilingual programming in Spanish and English, takepart | makeart provides Santa Barbara’s diverse communities with new opportunities to explore contemporary art in the neighborhoods where we live, work, and play. This talk is part of UCSB’s Spring 2017 Visiting Artist Colloquium and Curatorial Conversations. The program offers a wide range of voices in dialogue, exploring the topics of contemporary art, theory, and cultural production by emerging and established visiting artists, as well as members of UCSB’s own campus faculty and graduate students. Presentations will take place each Thursday, from April 6 through June 8 2017. All lectures are free and open to the public, held each Thursday from 5:00 to 6:50pm in UCSB’s Embarcadero Hall in Isla Vista. For directions to location, please visit UCSB campus map.